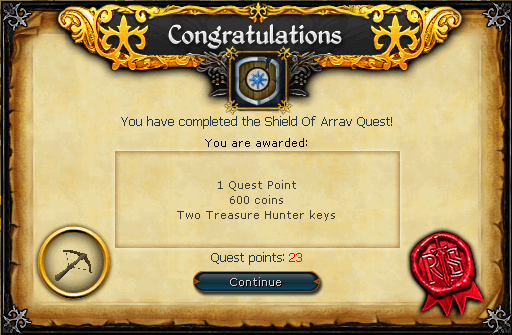 The Shield of Arrav was one of the few quests to be released with Runescape in early 2001 and kicks off the Arrav storyline, which was eventually concluded 10 years after the Shield of Arrav's release. With you and a friend reconstruct the legendary Shield of Arrav and perhaps pick up some street smarts on the way. Before beginning this quest it is highly advisable that you get a friend that has not completed it yet. 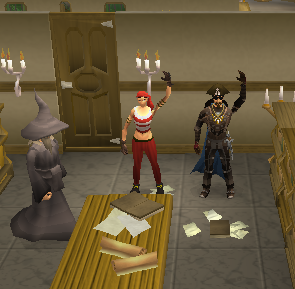 Once you have found a friend, make your way to the Library at the northern end of Varrock Castle. Speak to Reldo and ask him for a quest. At first he will be unsure if he has any, but after a bit of thought he asks you to look for a book. He mentions the book is nearby in one of the shelves. This book can be seen by the blue and white shield on a top shelf, facing away from the desk. Take it and read it. After reading the book talk to Reldo and he will tell you to talk to Baraek. Now that both of you have started the quest, decide on the gang that each of you will join. Apparently the shield was broken in half, and each gang has 1 piece. You'll each have to join a different gang to get both halves. If you plan on joining the Black Arm Gang do not talk to Baraek! 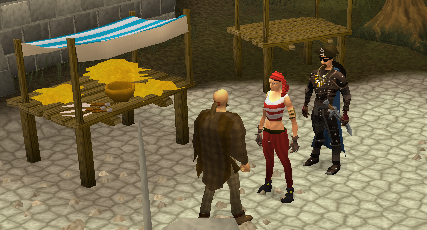 Baraek can be found outside Varrock Castle in the marketplace, near the fur stall. 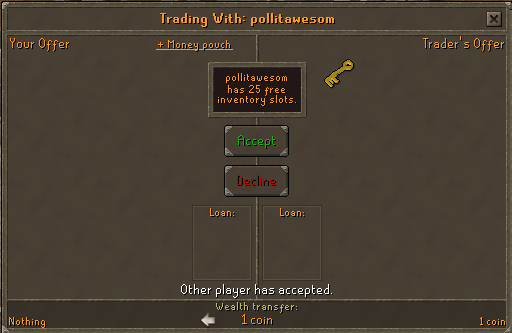 Ask him about the gang, but before he gives out the location, he wants 20gp. After he tells you about the location of the gang, head along the south wall of the city, walking east until you see a small building with a dungeon symbol . Climb down the ladder. Once down talk to Straven. Ask him about the Phoenix Gang. At first he will pretend that he does not know what you are talking about, but you continue to press your point. He still continues to deny everything but he mentions Jonny the Beard, a member of their rival gang who is supposed to have an intel report on his person. He hints that the removal of such a person as well as the acquisition of such a report could prove useful to anyone joining the said Phoenix Gang. 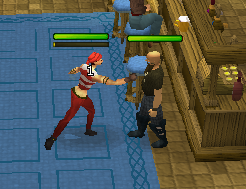 Jonny the Beard is found in the Bar not far northwest from the hideout. You can attempt to talk to him, but in the end you must kill him. Jonny the Beard is a level 2. With him dead pick up the intel report. Take the report back to Straven and he will give you a key. This key is used to open both the hideout and the weapons' storage building. 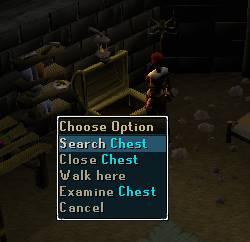 Enter the hideout and head southwest until you see a chest. Open and search it. You should obtain a left-half shield. As soon as you get the left-half shield, climb the ladder and meet your partner outside. Trade him the Weapon Store Key, and send him to the weapon store room. Once he is inside, he should kill the level 30 Weapons' Master and pick up the two phoenix crossbows. Afterwards, he will take them to his own gang's headquarters and obtain his own half of the shield. Then make your way to the museum. Your partners' complete quest walkthrough can be found in the below section. 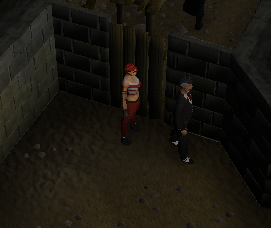 After talking to Reldo, talk to Charlie the Tramp at the southern entrance to Varrock. Ask him about what is down the alley. After he tells you that that is the alley to the Black Arm Gang's headquarters, ask him if you would be allowed in. He responds that he doesn't know and that you should try talking with Katrine. Katrine should be in the second room north of the end of the alley. At first she is unsure of your intentions, but in the end she mentions she may have a job for you to do. Accept the offer and she will give you point you in the direction of the Weapons Room. 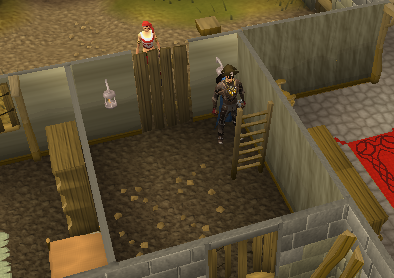 The Weapons Room is just east of the ladder to the Phoenix Gang's hideout. It is now that your Phoenix accomplice should trade you their key. Enter the building to the east with the ladder going up and go up the ladder. 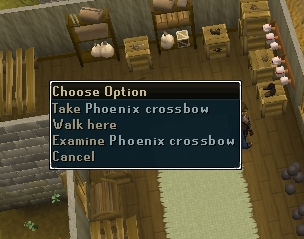 Once at the top you can pick up the Phoenix crossbows but not until you have disposed of the level 30 Weapons Master. Kill the Weapons Master (who uses melee) and pick up the crossbows. Then go back to Katrine and give her the crossbows. Now go upstairs and search the cupboard on the east wall for a right-half shield. Once you have your half of the shield go to the museum and use it on the Curator. He will be immensely surprised but then he will take it from you and give you two certificates of your appropriate shield half. He will let you know that you cannot complete the quest with just one half of the certificate. But fortunately for you, you have a friend who can give you their second certificate! Put the two pieces together. You should get a warning telling you that the paper will become untradable once you put it together. Put it together anyways as you will not need to trade the complete certificate. Once you have the full certificate take it to the King in Varrock Castle. Needless to say, he will be surprised as well and after a bit of talking he will give you your reward. Congratulations, Quest Complete! 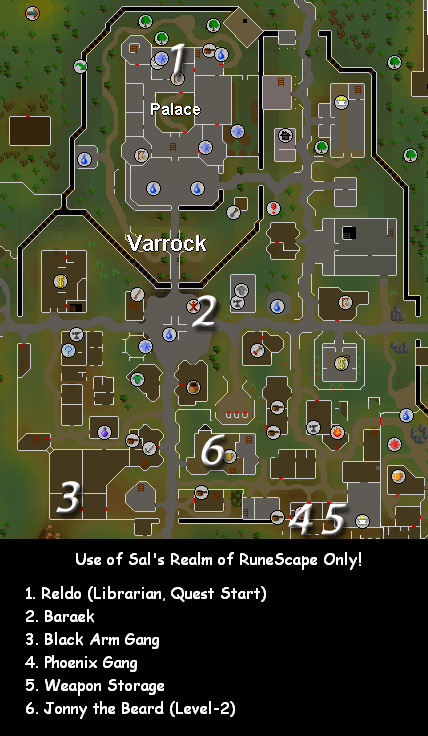 [^] Talk to Reldo in the Varrock Castle library. 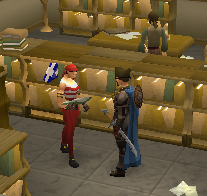 [^] Find the book about the Shield of Arrav in the library. [^] Talk to Baraek and pay him 20gp. [^] Enter the Phoenix Gang's hideout and talk to Straven. 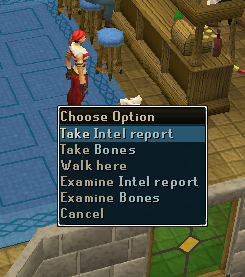 [^] Kill Johnny the Beard at the Blue Moon Inn to get an Intel Report. [^] Bring the report to Straven to get a key. 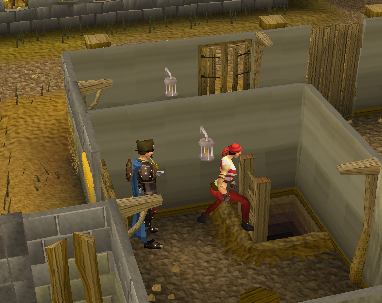 [^] Enter the hideout and open the chest in the southwest to get a Left Half Shield. [^] Trade your partner and give him or her the Weapon Store Key. 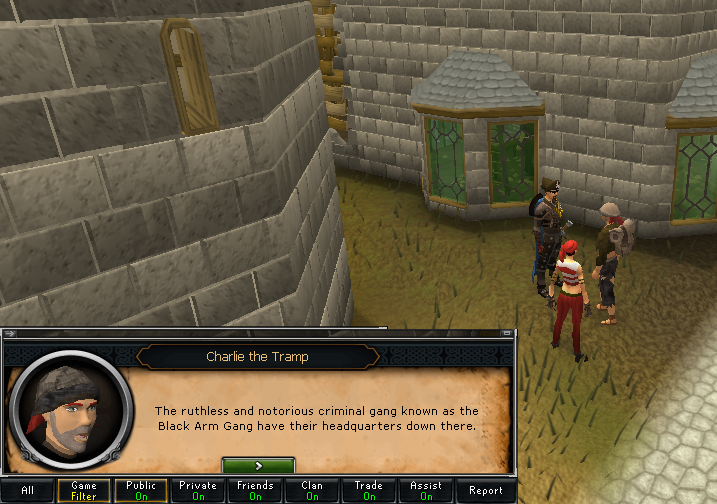 [^] Talk to Charlie the Tramp near the Sword Shop, ask about the alley. [^] Go inside the Phoenix Gang building and talk to Katrine. [^] Get the Weapon Store Key from your partner. [^] Enter the Weapon Store Room using the Weapon Store Key and climb the ladder. [^] Kill the level 30 Weaponsmaster and take the crossbows that he drops. 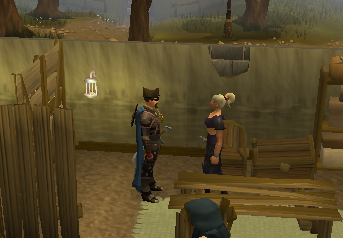 [^] Give Katrine the Phoenix Crossbows that your Phoenix Gang friend gave to you. 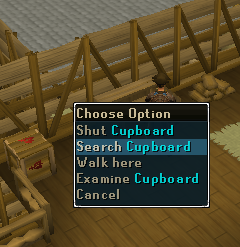 [^] Go upstairs, search the cupboard on the wall for a Right Half Shield. [^] Each of you should bring your half shield to the museum Curator to get two half-certificates for your shield half. 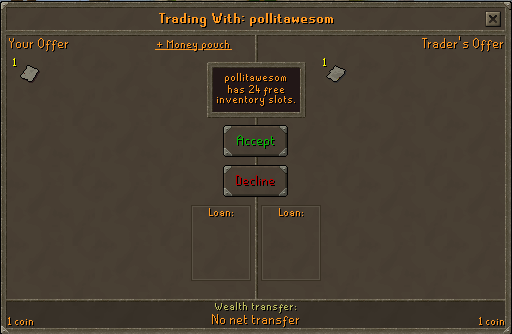 [^] Trade one certificate half to your friend in the opposite gang (he or she should trade on of their halves too). [^] Use the certificate half together, then talk to King Roald to retrieve your reward.